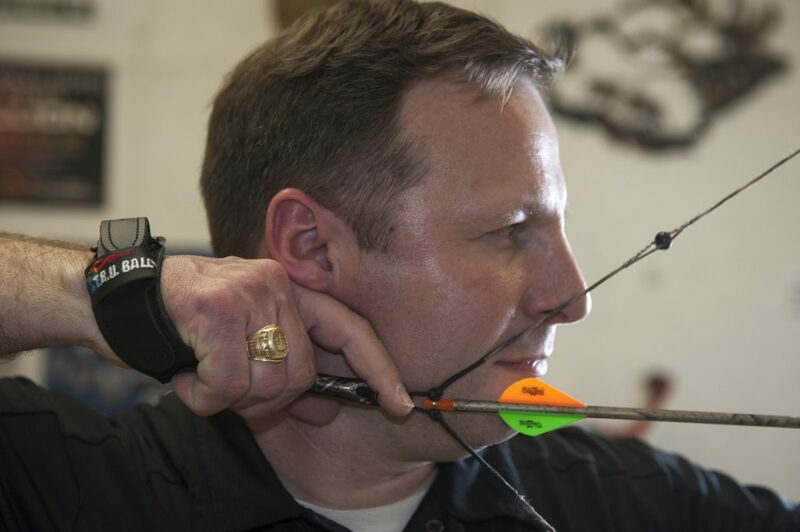 When two of the world’s leading archers took the field in the 2012 London Olympics, Ben Summers ’00 MBA recognized something on one of the bows. South Korea’s Oh Jin Hyek was using equipment Ben had sold him just a few years before — a sight that Ben’s family business had made in Madison Heights, Virginia. Hyek drew his bowstring, peered at the target through the sight, and shot one arrow after another to the middle of the target. He won the gold medal. Ben’s company makes T.R.U. 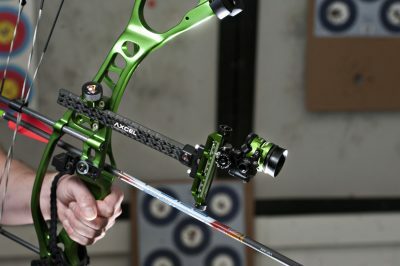 Ball archery releases and Axcel sights and scopes and markets them around the world. In addition to hunters, decorated shooters at all levels of competition trust the products to give them an accurate shot. “Almost everyone who wins now uses both our triggers and sights,” Ben said. 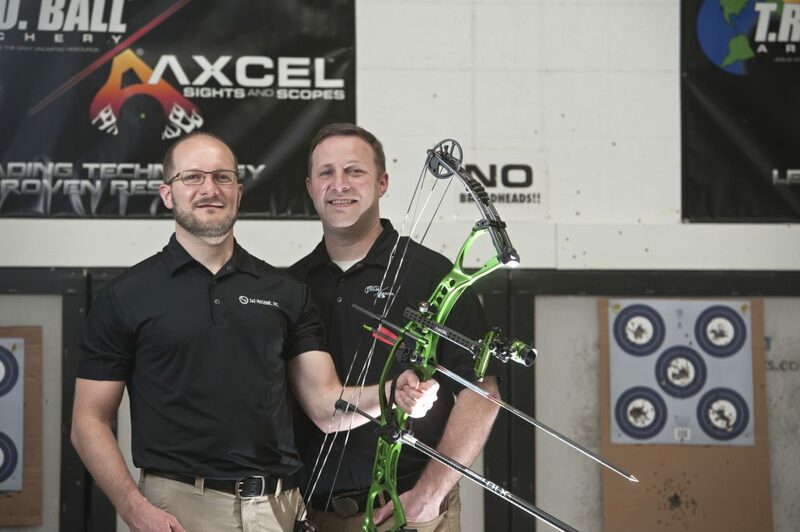 After earning their master’s degrees in business at University of Lynchburg, Brian and Ben Summers helped their family archery equipment business grow internationally. Ben runs the company alongside younger brother, Brian Summers ’03 MBA, and their sister, Kelly Summers Reyes. Ben and Brian each said that the business education they received at Lynchburg has helped them keep the company on target as it has grown internationally navigated a turbulent business environment. “It’s nice to have a good foundation in education and be successful,” said Brian. Axcel sights and scopes produced by Tomorrow’s Resources Unlimited are among the most trusted in the industry. Their father, Greg Summers, founded S&S Machine Shop more than 30 years ago. In the mid-1990s, some clients were taking their machining work in-house or sending it overseas, forcing S&S to find a new line of business. Greg saw an opportunity in archery products and formed the company Tomorrow’s Resources Unlimited. When Ben was 18, he traveled the state of Virginia to sell archery equipment out of a suitcase. After he finished his undergraduate degree in religion, he decided against becoming a pastor and joined the family company. He wanted to continue his education with a degree that would help him in business, and a friend recommended the University of Lynchburg MBA program, so he signed up. “It helped me in big ways when it actually came to running the business,” he said. He particularly remembers Dr. Atul Gupta’s operations management class, in which he learned to maximize production through smart management in day-to-day operations. Brian said the MBA gave him a valuable foundation for managing accounting, human resources, and distribution channels, especially as the company has expanded globally. When he earned his degree, more companies were starting to use electronic data interchange to communicate with suppliers and place automatic orders whenever they made sales. Brian took advantage of one class assignment and wrote about EDI, which helped him implement it for the family business. EDI capabilities are critical now that most customers expect manufacturers to ship smaller quantities of products directly to stores rather than large quantities to a retailer’s distribution center. The MBA also prepared Brian to do business internationally and manage accounts with major customers, setting appropriate price structures depending on the retailers’ business models. Wearing his University of Lynchburg class ring, Ben Summers demonstrates the use of a T.R.U. Ball archery trigger, which his company sells around the world. In addition to helping lead a globally known archery company, Ben leads in the industry. He joined the Archery Trade Association board of directors about 11 years ago, and he became chairman in 2016. He said the MBA helped him develop skills he needs as he works with legislators and other people in the industry. The Master of Business Administration program at University of Lynchburg consistently places among the top tier of MBAs in North America ranked by CEO Magazine. Learn more about the program, or attend an upcoming graduate information session.